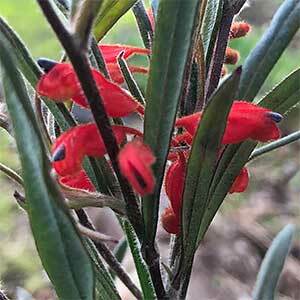 An unusual upright small shrub, Grevillea bronwenae is originally from Western Australia. Brilliant Scarlet red flowers from winter to spring attract birds to the garden. The leaves are long and elliptical and a deep green. This species is generally sold as a grafted form, and this makes it more suited to cultivation. Look for “Red Ochre” on of the best varieties for general garden use. Even the grafted forms are best planted in a garden bed that has been hilled up a little to improve drainage. Poor drainage is a real problem with this species. You can lightly tip prune from an early stage to maintain a more bushy habit if desired. Tip pruning will also encourage more flowers. Height – To 1.5 metres. Spread – To around .7 metre. Flowering – Time Spring to summer although will spot flower through the year.